The Smartphones Operating System Audits. 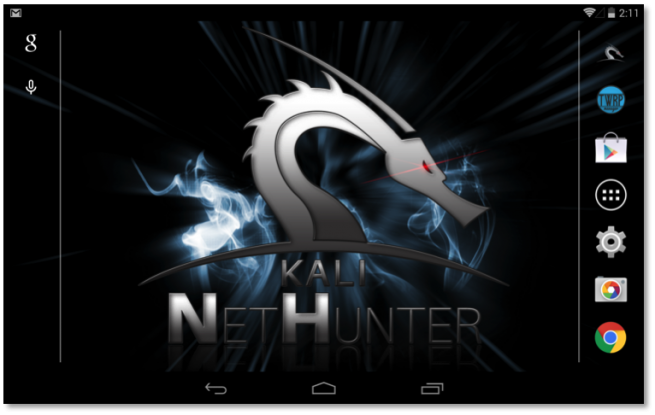 Nethunter is an operating system developed by the creators of Kali Linux that allows us to offer a full suite of security on our smartphone from which to easily audit any network without having a complete computer to run the full suite of Kali anytime, anywhere. Several days ago the developers released a new version of Kali Linux desktop operating system with which to perform all types of security audits to networks. Following the development of its software have also updated its mobile operating system based on Android called Nethunter, to integrate some of the new features included in the previous compilation of Kali and add some improvements to the mobile operating system. The main novelties of Nethunter 1.1 include, among several enhancements and fixes, the new Backdoor Factory module, which was included in the official release of Kali and is now also available in Nethunter with that open backdoors to binary traveling by the network in real time so that we can take control of any system from the network patching files as they reach their destination on a MITM attack. Also we have included a new control center from which to control all services enabled and disabled by your smartphone (ssh, dns, etc) and the ability to change the keyboard layout to accommodate the widest possible audience because, until now, the keyboard layout was one of the main complaints of users from different countries. To ease installation of compatible devices rom developers have released a binary for Windows that will connect our device with the drivers and proceed to install the rom on it automatically without the need to install developer skills manually from a recovery or from adb. This ROM based on Android although adapted to run the various tools of Kali is not compatible with all models of smartphone market, but it only works with EPO (OnePlus One) and the Nexus 4, devices that already have the images official to install the operating system on them. Other devices, but will receive the corresponding images, still have to wait to use Nethunter. Have you already tried the rom Nethunter? Do you know of other tools that allow us to perform security audits from our smartphones?